As Esurance established its brand presence in the crowded U.S. insurance marketplace, new brand campaigns were needed to cement the company as THE innovator in its category with its tech-savvy target. Paramount studio’s exciting film updating the Star Trek franchise was the perfect vehicle to help accomplish this. The campaign achieved more than a million substantial interactions with the co-branded micro-site from January to May. Esurance also received a large number of email addresses for new prospects for remarketing purposes. The destination for the entire campaign would be the Star Trek-themed micro-site. 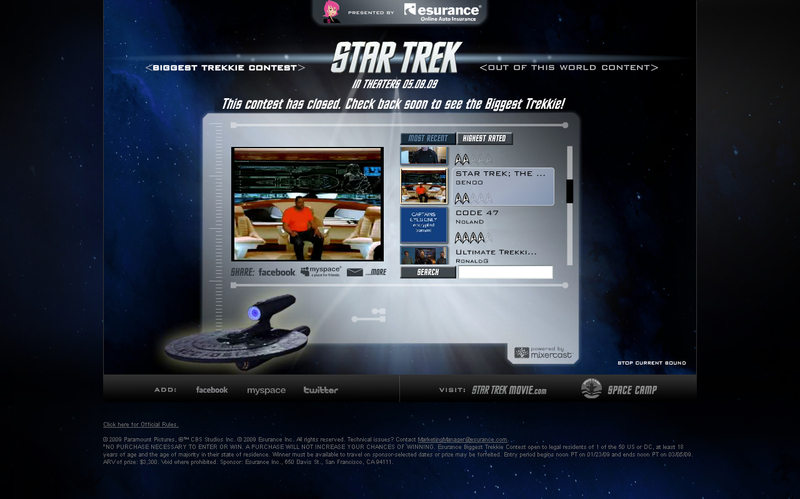 On this Web site, in Phase I, Esurance hosted a user-generated content contest asking the audience to submit videos outlining why the contestant was the galaxy’s biggest Trekkie. The winner would get to attend the L.A. premiere of the latest Star Trek film. Visitors could vote on their favorite videos, thus encouraging contestants to spread the word among their own social networks. 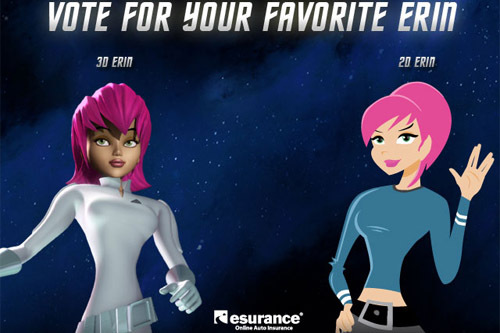 To ensure that visitors had a reason to engage in repeat visits and prolonged interactions with the brands when they did visit the micro-site, a Flash game, “Delta Vega: Meltdown on the Ice Planet,” was developed allowing users to adopt the identity of Erin Esurance (the company’s brand icon) as they passed through challenges relating to the Star Trek film. Upon successful completion after repeated plays, one of the Star Trek film’s new characters was revealed. The site also featured exclusive content from the film. Later in the campaign, a second contest was launched. A more standard promotion, this contest sought to engage the mass market with the two brands and gain emails for remarketing purposes. The prize was a trip for two adults to Space Camp. Given the cult status of the Star Trek franchise, fans were quick to spread word of the contests and the unique content among their social networks. My public relations team worked with fan sites to ensure that these locations were also distributing news about the campaign to motivated audiences. Artwork and content was developed for these fan sites to post. Esurance also promoted the elements of the campaign using the company’s Facebook, MySpace, and Twitter presence. In conceptualizing the look needed for the :30 TV and :15 online video components of the campaign, I decided to try a new look for the company’s brand icon, Erin Esurance. With a cult following of her own, the relationship with the Star Trek title gave me permission to work with a 3-D rendering of the typically 2-D figure. This character rendering also worked better with the slick, high tech look and feel of the Star Trek iconography. Companion banners were also created to accompany the online video. Though PR efforts were largely focused on activating social networks, traditional PR was also a focus throughout the campaign. Rich media press releases were created and issued on the wire highlighting the contests, and also, the “special edition” change in Esurance’s brand icon.